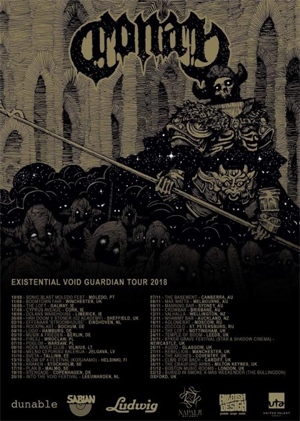 CONAN Release Video For New Single "Volt Thrower"
On September 14 the British supreme doom trio CONAN will release their brand-new record Existential Void Guardian. Before the full power of this new monster will hit you, their new single "Volt Thrower" and its video give you a first taste of what will await you. So make sure to dive into this 4 minute spacey masterpiece of doom, low tuning and surrealism! ""Volt Thrower" is maybe the most 'pop' track on the album. Sometimes a song just happens without you trying too hard and this is it. Chris was making a cup of tea, Johnny was in the live room and I just said 'play along to this'. We jammed the song, jammed it again, then Chris came in and we had a cup of tea, we then recorded it in one take. It is a song about triumph over adversity, an army on the brink of defeat is able to summon the end of evil, the banisher of hatred. From the lake of frozen souls, all hail Volt Thrower. If only life was this easy." If troglodytes could have gotten their paws on a Fuzzthrone or other fuzz pedals...they would have probably bashed each other`s skulls in. CONAN on the other hand use these beautiful tools to wrench the maximum out of their legendary Caveman Battle Doom: could there be a more monolithic opener than "Prosper On The Path"? Narp. The British trio presents a tar monster named Existential Void Guardian that seems even more menacing as soon as it gets high on its own downtuned groove frenzy. 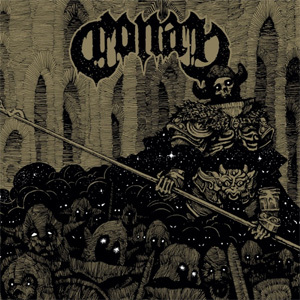 Two years after the remarkable Revengeance, CONAN once more leave us baffled with a previously unknown side to dual vocal sludge - behold the painful melody splinters "Eye To Eye To Eye" leaves behind or the insane grind intermezzo that is "Paincantation". True beauty lies in dissonance, and it always will.